I got a phone call from my dear friend and old neighbour last weekend asking if I wanted to come over with the boys for a BBQ? I think it took me all of about 5 seconds to say YES! News flash people- If you put a plate of food in front of a friend/chef that they didn't have to think about, cook or even enter a kitchen before eating then 9 times out of 10 they/I will love you for it. I gotta love Megs, she use to say things like this to me before we really knew each other, however, she would always follow through with, 'but I'll invite you anyway' and for that I just love her. I've been on a bit of a sausage craze at the moment. Not quite sure why this is but I decided to make a dessert to bring seeing as sausages don't really get anyone excited at a barbie...and when you've been invited to a BBQ it has always been drummed into me that you must bring a plate of something. Originally I was going to make a pavlova (who doesn't love a pav?) but as the day progressed the sun got hotter and hotter, our car no longer has air conditioning and it was a 30 minute drive out to our old neighbourhood so I was thinking all I'd have left to show would be a great big pile of melted cream and sugar on a platter with berries floating around in it! 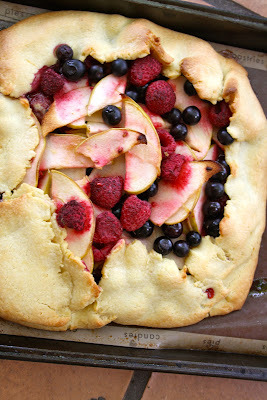 The heat made me think of a galette. I could use all the berries I had bought and still make it look fabulous without the headache of it melting. The dough is a wonderful recipe that only takes about 2 minutes to whip up in the food processor. You then need to pop it in the fridge to cool for about 30 minutes before rolling it out, putting the filling on top and pulling up the sides to keep it all in place- EASY! The galette was well received and devoured by all. My boys were disappointed I didn't save any for them but I hardly felt bad because minutes before they were sitting on the back lawn chowing down on ice creams and chocolate. As I told them, I'm sure I'll be making it again and again because a) it was so easy b) I got to add my new favourite ingredient to the mixture -argave syrup and c) it's a perfect dessert for summer and winter! Put above ingredients into food processor and blend 5 sec. Add 4oz (124grams) of cubed cold butter and process until coarse breadcrumbs. While the motor is running add above ingredients to the food processor and process until it just holds. Remove and kneed dough lightly on bench. Wrap in plastic wrap and put in cooler for an hour. Roll out dough on glad wrap into a circle or triangle shape about 40 cm diameter. Place grease proof paper onto an oven tray then slide on your rolled out pastry, removing the glad wrap. Sprinkle with raw sugar in the middle, leaving an inch around the side for folding. In a small bowl add apple, lemon, argave and ¾ of blueberries and raspberries. Fold to combine then pour into centre of pastry. Fold the sides of the pastry around the apple and berry mould, making a collar for the fruit. 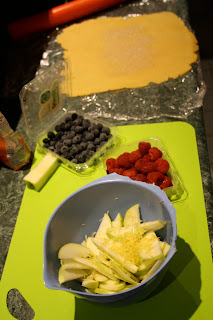 Add remaining raspberries and blueberries to t he top of galette for added colour. Preheat oven to 180ºC (350). Place galette tray into oven for 20 minutes or until pastry is lightly browned and fruit is bubbling. Ah crap! I'm the sort of friend who said Yay Camilla's coming around she can make us lunch!!! That looks yummy! Have to give it a try! i am not a chef ...but i love to cook and experiment with all sorts of foods....I am with you about the NOT getting invites becasue you might critic their cooking...i just love the company and any food.. if i dont cook it ..who cares...!!!! Thanks for sharing this gorgeous summer berry pastry.. it will be a must try in our house as the grand kids are here and we have been berry picking at Longford and Lilydale..blue berries and all sorts of berries..Yummo!!! I love the little glimpses into summer cooking that you give us! It looks wonderful Camilla. All the berries that I can get my hands on are sour little shells of what I know they should be and cost about as much a car payment. Nettie- thanks for stopping by! The kids will love helping you make this also. Your zucchini fritters look wonderful BTW. Yum! Love how easy galettes are.